Antiquities cover artefacts from ancient Greece, Rome and Egypt and include early coinage. Egyptian artefacts are particularly popular at aucton. 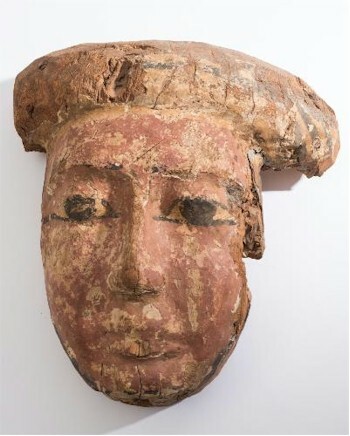 An Egyptian Carved Wooden Mummy's Mask (FS24/660). Egyptian antiquities often include burial pieces, normally late dynasty dating to Cleopatra's reign. These can include Shabtis, which are small adult male or female figures usually either inscribed with a special formula to be recited to save the deceased from arduous manual tasks in the afterlife or actually depicting the task from which they were to be saved. Shabti are usually made in clay, turquoise or gold. Scarabs were popular amulets in ancient Egypt and were often beatle-shaped. They were usually either burial pieces or good luck charms and are increasingly found in our auctions.